Tweet Whistle - Increase your targeted followers with an affordable Twitter marketing solution that can also help automate your Twitter posts, send follows, send unfollows, send messages, and much more. Tweet Whistle is a unique and powerful program that allows you to automatically find and follow like minded people. Tweet Whistle - Increase your targeted followers with an affordable Twitter marketing solution that can also help automate your Twitter posts, send follows, send unfollows, send messages, and much more. 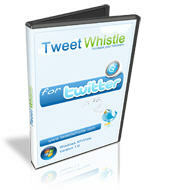 A must have tool for anyone serious about promoting their online business or Twitter account. Features currently available: Search for users by Tweet keywords, Search for users by Bio keywords, Search for users who have referenced other people, Search for users by location, Search for users who display a certain attitude, Search for followers of other users, Check the current or weekly trends, Find out who has mentioned your profile, Automatically send follows, Automatically send unfollows, Automatically send messages, Automatically send tweets, Random time delay settings, Save and Load profile lists, Works with unlimited number of accounts, Automatic software updates, And much more. Download the FREE Trial today! Works with unlimited number of accounts. Search for users by Tweet keywords. Search for users by Bio keywords. Search for users who have referenced other people. Search for users by location. Search for users who display a certain attittude. Search for followers of other users. Check the the current or weekly trends. Find out who has mentioned your profile. Manage all your DM's from one location. Automatically send DM's to new followers. Manage safelists of users not to unfollow. Automatically send RSS Feed tweets. Save and Load profile lists.